Dell has launched the XPS 12 2-in-1 and XPS 12 notebook in India. Both devices come with sixth generation Intel Core Processors and features like Thunderbolt 3. The Dell XPS 12 is the first 2-in-1 to come with a 4K Ultra HD display, while the Dell XPS 13 has an Infinity Edge display. Prices for the XPS 13 start at Rs. 76,990, while the prices for the XPS 12 start at Rs. 1,24,990. Dell India, the world’s fastest growing large integrated IT Company, today announced the launch of the award winning Dell XPS family in India. The stunning new portfolio includes the all new XPS 12 2-in-1 and the ultra-mobile XPS 13 notebook. Continuing to build on the XPS family’s legacy of uniting form and function, this updated lineup is designed to offer the best consumer laptops, incorporating high performance 6th generation Intel Core processors and sleeker hardware, all built for an enhanced user experience. The new XPS portfolio includes various form-factor breakthroughs, display prowess, battery life and more – maintaining the tradition of offering the best computing experience. The XPS family now comes with best-in-class features such as, Thunderbolt™ 3, which enables one-cable docking and up to eight times faster downloads than USB 3.0, and the capability to connect with the next generation of Thunderbolt docking. The devices also feature stunning panels with sharp detail and accurate colors, along with the latest graphics and processors, offering the perfect blend of performance, mobility and durability and catering to power users looking for devices to keep up with their pace. The Dell XPS 12 also includes the world’s first 4K Ultra HD Display in a 2-in-1 which sets it apart from the rest. Additionally, Dell XPS laptops are among the most environmentally friendly portfolio Dell offers, designed with smarter materials and shipped in recyclable, compost-friendly packaging, ensuring the environment is always top of mind. Perfecting the laptop to tablet experience, the new and innovative XPS 12 2-in-1 is designed to easily switch between laptop and tablet with a magnetic connection that enables one-handed transition. It is the only 2-in-1 device with a 4K Ultra HD display option, with 6 million more pixels than a Full HD display. Packed with high resolution cameras – 8MP world-facing, 5MP user-facing – the XPS 12 allows users to capture their world the way they see it. The device comes with IPS wide-viewing angles, which offers 170° views on a brilliantly bright, 400-nit screen with rich colour – giving users’ a rich multimedia experience be it movies, presentations or photographs. Built with magnesium alloy, the XPS 12 2-in-1 also sports edge-to-edge Corning® Gorilla Glass NBT™ which prevents scratches caused while handling, cleaning or wiping. The 2-in-1 comes standard with a mobility base, which provides a sleek full-size backlit keyboard and precision touchpad for working on-the-go, as well as the custom-built Dell Premier Folio, which provides a stand for the tablet with variable angle positions and also keeps the device safe during travel. The new design comes with the option of using a Dell Active Stylus that can be used for note taking, either on OneNote or for casual sketching. Building on an impressive showing at CES 2015, the smallest 13-inch form factor in the world – the award-winning XPS 13 with Infinity Edge Display, now features 6th generation Intel Core processors and graphics, more storage and memory (up to 1TB[ii] PCIe SSDs and 16GB RAM,[iii] respectively) and Thunderbolt™ 3. The XPS 13’s popular form factor continues to impress, still holding its title of the smallest 33 cm (13) laptop on the planet, as well as the first with a virtually borderless InfinityEdge display. With up to 18 hours, 14 minutes of battery life with a FHD display,[iv] the XPS 13 also offers the longest battery life on a 33 cm (13) laptop. Users can stay powered up, connected and protected on the go, and productive in the office, with purpose-built accessories for the XPS portfolio. Dell Thunderbolt™ Dock – TB15: Charge and connect XPS laptops to a single data and power source to allow for the ultimate display performance - up to three Full HD displays or two 4K displays - and faster data transfers with the Dell Thunderbolt™ Dock with Intel® Thunderbolt™ 3 cable. Dell Dock – WD15: Charge and connect XPS laptops to up to two Full HD displays and five other peripheral devices and enable increased video performance with a single, USB Type-C cable to provide power, Ethernet, audio, USB, and video. Dell Adapter - USB Type-C to HDMI/VGA/Ethernet/USB 3.0: Connect the XPS to multiple devices – projectors, TVs, displays, and Ethernet – with one dongle. Dell Bluetooth Mouse - WM615: Combines high performance with an innovative design which transforms from comfort to ultra-portability and increases productivity while on the go. Dell Active Pen: Optimized to take advantage of Microsoft® Edge’s annotating features. Easily take notes with Microsoft® OneNote in one click or capture content in only two clicks. For the creative type, use Bamboo Paper to take notes, sketch or draw, just like on paper. Cortana: Dell premium audio features, including Studio-quality voice enhancement with Waves MaxxAudio® Pro, help make it easier and more reliable to interact with Cortana, your virtual personal assistant. 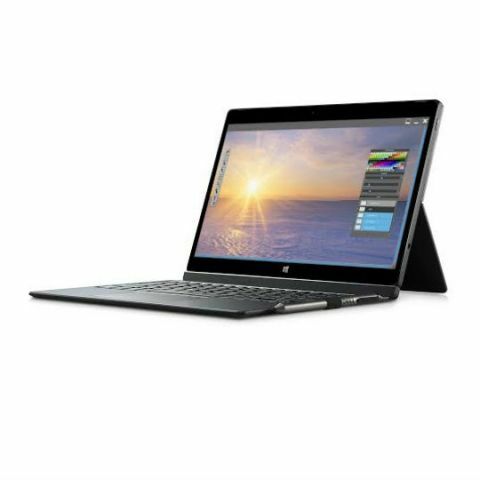 Continuum: Dell 2-in-1 devices, like the new XPS 12, utilize Continuum, which helps people transition seamlessly between tablet and desktop modes. Microsoft Edge: Dell PCs deliver a great pen experience which is brought to life better with the Microsoft Edge browser. Now you can annotate web pages and share them with anyone - at work and for play. Pair the XPS 12 with the Dell Active Pen to take notes on webpages to share with anyone.